Accueil Produits Bande originale La bande originale de “Le vol du navigator”. La bande originale de “Le vol du navigator”. Label : Super Tracks Music. Film : Le vol du navigator. 1. 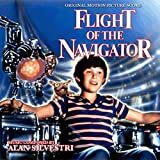 Theme from Flight of the Navigator – 2:49. 2. Main Title – 3:29. 3. The Ship Beckons – 1:05. 4. David in the Woods – 2:33. 5. Robot Romp – 2:29. 6. Transporting the Ship – 1:17. 7. Ship Drop – 2:34. 8. Have to Help a Friend – 3:09. 9. The Shadow Universe – 1:59. 12. Star Dancing – 3:20.